sider your communications as an extension of your brand and identity. A few popular ideas from which clients can derive value include: local restaurant guides, tax tips for homeowners, reports on home values and the marketplace, or highlighting home décor and landscaping trends. Make your communications readable and useful, and your clients past and present will think twice before skipping past your name. 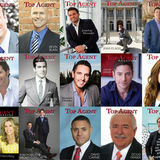 Showcase the lifestyle Clients remember when you go the extra mile, and that additional effort distinguishes run-of-the-mill agents from high-powered professionals. Whether listing or buying, consider a property’s lifestyle. First, think about a client’s everyday experience. Where’s the best breakfast spot nearby? How’s access to public transportation or bike paths? Which outdoor recreational opportunities exist in the area? Where might your client swing by for coffee? Neighborhood guides that outline the livability of a home and its area not only boost value and highlight potential, but they also demonstrate your ability to think outside the box and connect on a personal level. After all, a home isn’t just a house; a home is all about the daily experience that unfolds within and beyond those four walls. With that in mind, do your homework and make yourself a local expert. Your clients will feel they’re in good hands and will better envision their future unfolding, all thanks to your thorough legwork. message, or email, whereas older clientele may prefer face-to-face time or connecting by phone call. Adapting your communication style is as simple as a brief discussion: ask your client how they prefer to communicate and adapt accordingly. While it may seem like a small matter, it provides clients with a sense of comfort and control. Again, the key here is communication. Talk with your clients about their preferred methodology. Maybe they prefer a marathon house-hunting trek on a weekend day, or perhaps they rather sift through listings online before making in-person visits to a narrowed list. It’s okay to encourage clients or fill them in on industry norms, but it’s important to create an experience that’s tailored to their style and personality. Authentically seek feedback While it may feel uncomfortable, asking for feedback during and at the end of a transaction can dramatically improve your working style and professional blind-spots. It can also help you adapt your working style to better suit your respective clients. Of course, it’s important to be open-minded and to quash the need to be defensive. Not all feedback will be useful, but you can incorporate the parts that are. This not only grows your skillset, but it also demonstrates to clients that you are open to constructive criticism and sincerely prioritize a job well done over personal praise. As a bonus, positive feedback can be parlayed into client testimonials, which are incredibly useful tools to boost your business on the whole. It’s no secret that real estate is a busy, self-determined business. While your client care may feel all accounted for, there is always room to grow. Professionals at the top of their field know this and never stop building out their repertoire. If you want to take your business to the next level and create an imprint that’s synonymous with concierge care, then keep these ideas in mind as you build your relationships and your brand. The “whys?” don’t matter. The back story may be very interesting and compelling, but does “why?” solve the problem of an erratic business or personal life? Most all independent contractors either sit down with the owner/broker/ sale manager/boss at the beginning of the year or as solopreneurs, by themselves, and go over goals and business/game plans. But like New Year’s resolutions, by January 15th, they lose focus and end up playing a smaller and more chaotic game than anticipated. This is not just about the business of business, but it’s also about the personal areas of life, as well. And this is not just about business and personal lives, but ultimately about the way they see themselves (self image/self esteem) and create the lifestyle that matches that perception...self fulfilling prophesies. There are so many ideas and systems about goal setting. Every speaker, sales manager and trainer has an approach. Know what? They all probably work, if the follow-through is committed to. Huge “IF” (I FEAR). Here’s my ofering at setting long term personal and business goals. The best way to predict the future is to create it. Family, Social and Spiritual. Unless you have something else---go with these. makes sense to you... in a draw under your socks or underwear, taped to the back of a closet door etc. 3. On the right hand side of the page, opposite each of the categories, write down 2 or 3 goals for each category. If you choose to not set goals in all areas, great! Do what feels right for you. There are no rules. 5. Look at the list every once in a while (daily, weekly ???) and let it reinforce the actions that will bring you to those, down the road, purposes. Spaced repetition is how you learn most of what you do. If you have difficulty looking ahead and projecting results, for a moment look back at your previous 3-5 years. What have you done in that time to move ahead in each of these 7 areas? “If you continue to do what you’ve been doing, you’ll continue to get what you’ve been getting.” The reality beyond that often used saying is that in the future, Mother Nature will smack us all around a little harder, gravity will tug on us all a little bit heavier, business slumps will become more pronounced, memory becomes more challenging and spiritual connections become even more distant, etc. What do you want instead? 6. Update your list periodically to reflect new directions and adjustments. Accomplishing longer term goals not only gives the rewards of whatever the goals are about, but on a higher level creates the positive self esteem and confidence of accomplishment. Confidence comes from creating victories. Those in therapy, or should be in therapy, experience control issues (usually a lack of control). When you’re in control of your life you generally make better decisions, feel more alive and healthy and usually become a more compelling figure to those around you. Copyright©, Barry Eisen. All rights reserved. 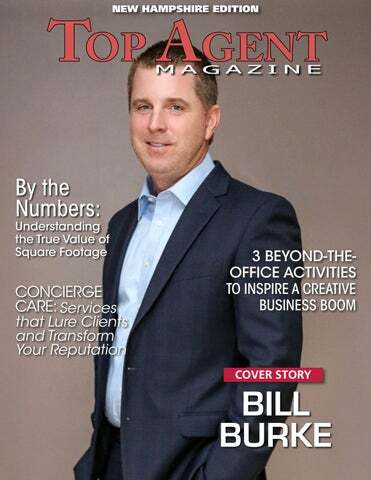 Based in New Hampshire, under the banner of Keller Williams Realty Salem, Top Agent Bill Burke serves clients across his home state, in addition to those in nearby Massachusetts. year, and that’s because I put in the time and effort to make it happen. I’ve always had a passion for real estate and I genuinely love what I do.” Today Bill has built a reputation as an agent known for his diligence, entrepreneurial spirit, and personal touch. To learn more about Bill Burke email BillBurke@KW.com, visit searchhomesnh.com call m: (603) 548 – 5315 / o: (603) 912 – 5470, or visit his Facebook page at facebook.com/NHREALESTATEPRO www. To stay ahead of the curve and build your brand, you’ve got to take the time to breathe new life into your practice and see things from a new angle. over, or at least want to experience a burst of inventive energy, consider some of the activities below. You may just shake up your routine, bend your brain in new ways, and inject some inspiration into your professional path. Expand your mind through meditation. You’ve likely heard all about the supposed powers of meditation, and perhaps you’ve long considered it an over-hyped New Age invention. But did you know that some of the foremost entrepreneurs of our era practice this cost-free, mentally restorative routine? From Oprah Winfrey to Steve Jobs, practitioners of meditation cite its stress-relieving principles, in addition to improvements in concentration, energy, self-awareness, and overall health. Even mainstream medicine is beginning to understand the preventative and restorative health benefits that meditation affords. As professional fields go, the mortgage and real estate industries require their fair share of emotional labor—you’re tasked with guiding clients through the investment of a lifetime. Meditation promotes peace and perspective, while reducing stress, adding a new level of self-awareness, and helping you mentally declutter. When it comes down to it, it only makes sense that taking time to go quiet and center your mind helps professionals find wherewithal amidst a hectic industry. Next time you’re feeling drained, out of ideas, or at your wit’s end—consider just fifteen minutes of meditation to get you started. Like most things, it takes some practice. But, if you commit the time, you’ll be thanking yourself later. too. Want to cut loose and have some fun? Join a board game meet-up group, take a cooking class, or try rock-climbing for the first time. A stimulating new activity will light up long-dormant parts of your brain, and your clients and colleagues will surely notice the influx of energy to your outlook. Still don’t think you have enough time to add something new to the mix? Blend your morning commute with an audio language learning service. The point is to shake-up your habits and introduce a new challenge that’s unrelated to work. Doing so can make you look at things in a new light and boost your mood along the way. your perspective entirely when removed from all your usual routines. New restaurants, traffic patterns, storefronts, weather—whatever the change may be, you’ll be experiencing everything brand new all around you. Taking the time for trips like these isn’t easy. In fact, making yourself devote those free days may be a difficult task itself. But it’s the most direct way to get a breath of truly fresh air, and when you return home you’ll be able to assess familiar surroundings in a totally new light. However you decide to add creativity to your professional life, don’t wait. Once you take the plunge, you’ll be regretting you hadn’t done it sooner. After all, the key to longevity is regular maintenance, so do your part and break the mold today.